Not Satisfied with your Project management software? Here are some points to consider before you deploy one. If you are a construction company who is depending on outsourced work then project management software can put greater control into your hands and reduce the amount of outsourced work. Project Management is just a piece of a much larger software , but it is an essential piece of a maze. A complete construction software allows businesses to manage the entire life cycle of each project through a collaborative and easily-accessible system. It can be very helpful with functions like job costing, estimating, facilitating Bill of Material (BOM) scheduling labour, equipment management and document management. 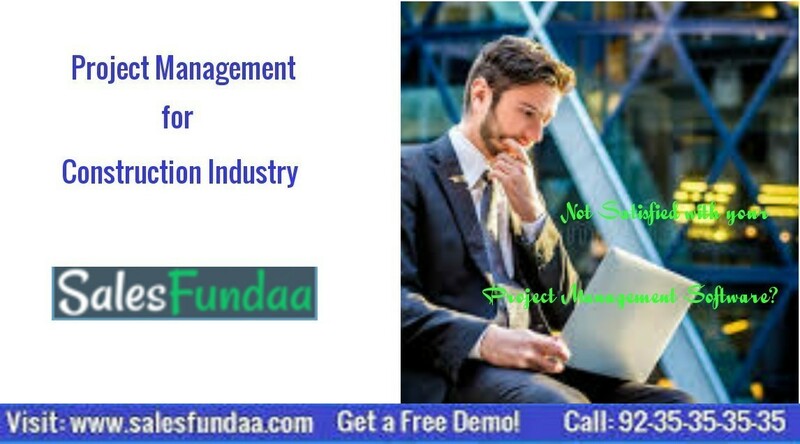 Deploying Salesfundaa Project management software can answer all your queries. We at Salesfundaa understand the various types of methodologies that are commonly practiced. Project management differs depending on the specific type of job. Any project manager may use a different method that best suit a particular project. For example in the Traditional Project Management which is a step by step process and assesses a project based on initiation, planning, execution, monitoring and completion. It is mostly suited for linear work where little change is expected and where each stage is done in chronological order, with stages only starting once the previous phase has finished. There is also the Critical Path method which is designed to accomplish projects in the least amount of time, in the most efficient manner as possible. And the Event chain methodology that initiate a chain of events. Here when each task is finished, a new event or task is created. Events may not always be anticipated and therefore the nature of the project are not of the linear type. There is also Agile project management where projects are divided into small sections called iterations where the team reviews and analyses the work done at the end of an iteration and decides what the next step for the project will be. Construction companies are largely investing in a project management solution that is used internally to better manage each job. These particular software however are built for project management in all industries. For construction specifically, there are a number of project management tools that collaborate with other functions of the business. Investing in a collaborative software solves many issues that construction companies commonly face, in addition to addressing project management needs. Training is undisputably the most important piece to the success of deployment of Project Management System for construction companies and builders. Without the proper training and education, it is difficult to understand your project type and the quiessential routing of collaborative modules that may be involved. Our support team can assist you to answer your queries. SalesFundaa Project Management software comes with a user friendly interface that allows even not so tech savvy users to use with ease. It supports in-house and outsourced work practices. Call today on 9235 35 35 35 to speak to an executive and take advantage of your ideal Salesfundaa Project Management Software.